Shadow #5187 - Yankee Golden Retriever Rescue, Inc. Shadow was 12 ½ years old when his owner could no longer care for him. Shadow’s owner lived in a split level home and the only way outside was by using the stairs. Shadow had some arthritis and he was also blind in one eye, which affected his depth perception. As a result, Shadow had fallen on the stairs and his owner, who was a senior herself, was not able to help him as he required. Sadly, she knew that Shadow needed a home that was easier for him to navigate. Shadow was dropped off directly at one of the vet hospitals we work with and he was given a complete senior exam. Our vet discovered that Shadow had a very large mass behind his eye. He was scheduled for surgery and the mass was removed. Although it was extensive, it turned out to be benign. Shadow would be much more comfortable without it putting pressure on his eye, which was also removed at the time of the surgery. Once he started his recovery from this surgery, we could see that Shadow really perked up. He was always a sweet, happy dog, but his tail began wagging even more now! 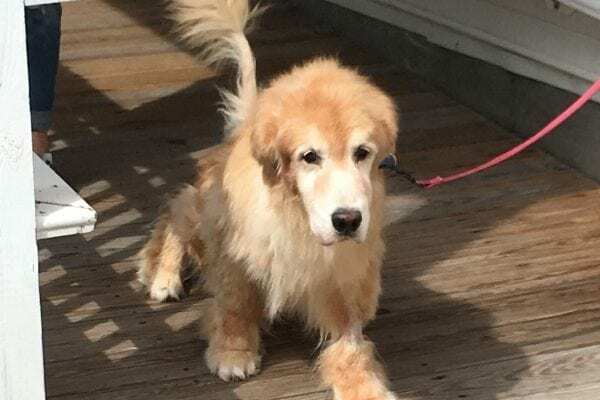 Shadow had the perfect senior Golden Retriever personality. He was very easygoing and gentle and got along with everyone. He enjoyed going for walks and spending time with staff and volunteers. He had very little interest in toys, much preferring to just be near people. He was a sweetheart who needed a special home! Shadow now has the perfect home for his needs. He loves his new home and yard, which has no stairs for him to negotiate. His adopter has a ramp to help him get in the car and he can’t wait to go for rides. Shadow also loves his tiny new “sister,” Sasha the Pomeranian. They make an adorable pair! 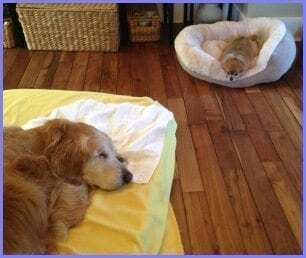 Shadow’s new home was specifically bought with dogs in mind, so Shadow will have all the comforts a senior Golden needs and deserves. Shadow’s adopter loves her new addition and says that every day with him is a blessing. Shadow has learned the routine at his new home very quickly. He and Sasha stand like soldiers in formation when it is time for walks or outside time, and again for feeding time – there is no fear that they will ever go hungry! Shadow loves his new home and family, and Shadow’s adopter loves hearing the thump-thump of a Golden tail greeting her once again! Shadow thanks you for your support. We have no upper age limit on dogs that are welcome here at YGRR. These special seniors require more medical care, and we are able to provide the care that will enable them to have the highest quality of life possible. You make these happy endings possible. Shadow and all the Rescue dogs thank you and send big thump-thumps and kisses your way!